We wanted to learn whether activity in the same area(s) of the brain correlate with the experience of beauty derived from different sources. 21 subjects took part in a brain-scanning experiment using functional magnetic resonance imaging. Prior to the experiment, they viewed pictures of paintings and listened to musical excerpts, both of which they rated on a scale of 1–9, with 9 being the most beautiful. This allowed us to select three sets of stimuli–beautiful, indifferent and ugly–which subjects viewed and heard in the scanner, and rated at the end of each presentation. 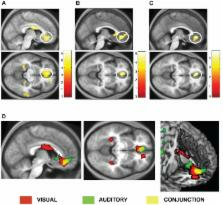 The results of a conjunction analysis of brain activity showed that, of the several areas that were active with each type of stimulus, only one cortical area, located in the medial orbito-frontal cortex (mOFC), was active during the experience of musical and visual beauty, with the activity produced by the experience of beauty derived from either source overlapping almost completely within it. The strength of activation in this part of the mOFC was proportional to the strength of the declared intensity of the experience of beauty. We conclude that, as far as activity in the brain is concerned, there is a faculty of beauty that is not dependent on the modality through which it is conveyed but which can be activated by at least two sources–musical and visual–and probably by other sources as well. This has led us to formulate a brain-based theory of beauty. Emotion, decision making and the orbitofrontal cortex. The somatic marker hypothesis provides a systems-level neuroanatomical and cognitive framework for decision making and the influence on it by emotion. The key idea of this hypothesis is that decision making is a process that is influenced by marker signals that arise in bioregulatory processes, including those that express themselves in emotions and feelings. This influence can occur at multiple levels of operation, some of which occur consciously and some of which occur non-consciously. Here we review studies that confirm various predictions from the hypothesis. The orbitofrontal cortex represents one critical structure in a neural system subserving decision making. Decision making is not mediated by the orbitofrontal cortex alone, but arises from large-scale systems that include other cortical and subcortical components. Such structures include the amygdala, the somatosensory/insular cortices and the peripheral nervous system. Here we focus only on the role of the orbitofrontal cortex in decision making and emotional processing, and the relationship between emotion, decision making and other cognitive functions of the frontal lobe, namely working memory. Mapping the functional connectivity of anterior cingulate cortex. Anterior cingulate cortex (ACC) is a nexus of information processing and regulation in the brain. Reflecting this central role, ACC is structurally and functionally heterogeneous, a fact long appreciated in studies of non-human primates. Human neuroimaging studies also recognize this functional heterogeneity, with meta-analyses and task-based studies demonstrating the existence of motor, cognitive and affective subdivisions. In contrast to task-based approaches, examinations of resting-state functional connectivity enable the characterization of task-independent patterns of correlated activity. In a novel approach to understanding ACC functional segregation, we systematically mapped ACC functional connectivity during rest. We examined patterns of functional connectivity for 16 seed ROIs systematically placed throughout caudal, rostral, and subgenual ACC in each hemisphere. First, our data support the commonly observed rostral/caudal distinction, but also suggest the existence of a dorsal/ventral functional distinction. For each of these distinctions, more fine-grained patterns of differentiation were observed than commonly appreciated in human imaging studies. Second, we demonstrate the presence of negatively predicted relationships between distinct ACC functional networks. In particular, we highlight negative relationships between rostral ACC-based affective networks (including the "default mode network") and dorsal-caudal ACC-based frontoparietal attention networks. Finally, interhemispheric activations were more strongly correlated between homologous regions than in non-homologous regions. We discuss the implications of our work for understanding ACC function and potential applications to clinical populations. Emotional responses to pleasant and unpleasant music correlate with activity in paralimbic brain regions. Neural correlates of the often-powerful emotional responses to music are poorly understood. Here we used positron emission tomography to examine cerebral blood flow (CBF) changes related to affective responses to music. Ten volunteers were scanned while listening to six versions of a novel musical passage varying systematically in degree of dissonance. Reciprocal CBF covariations were observed in several distinct paralimbic and neocortical regions as a function of dissonance and of perceived pleasantness/unpleasantness. The findings suggest that music may recruit neural mechanisms similar to those previously associated with pleasant/unpleasant emotional states, but different from those underlying other components of music perception, and other emotions such as fear. Conceived and designed the experiments: SZ TI. Performed the experiments: TI. Analyzed the data: TI SZ. Contributed reagents/materials/analysis tools: SZ TI. Wrote the paper: SZ TI. Copyright statement: Ishizu, Zeki. This is an open-access article distributed under the terms of the Creative Commons Attribution License, which permits unrestricted use, distribution, and reproduction in any medium, provided the original author and source are credited. Preliminary experience with MR-guided thermal ablation of brain tumors. Pitfalls in the detection of lipid vectors in neural cell culture and in brain tissue. Hypophysiotrophic systems in the brain of the Atlantic salmon. Neuronal innervation of the pituitary and the origin of pituitary dopamine and nonapeptides identified by means of combined carbocyanine tract tracing and immunocytochemistry.